Brave Hansen's dry wit as you sporting knowledge to the ultimate test in Alan Hansen's Sport Challenge. Serious Sport, Serious Challenge. Serious Fun. 03-07-2019 apholyon Box Text Alan Hansens Sports Challenge Brave Hansen's dry wit as you sporting knowledge to the ultimate test in Alan Hansen's Sport Challenge. . Hosted by the legendary Alan Hansen . Get your mates over for some serious competitions: for up to 4 teams or individuals . Eight rounds, 1000s 0f serious sports questions, loads of ways to battle it out . Easy and interactive controls; there'll only be one challenge to face Serious Sport, Serious Challenge. Serious Fun. 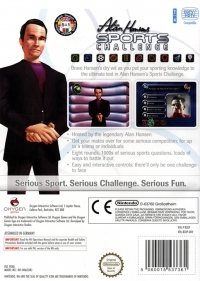 This is a list of VGCollect users who have Alan Hansen's Sports Challenge in their Collection. This is a list of VGCollect users who have Alan Hansen's Sports Challenge in their Sell List. This is a list of VGCollect users who have Alan Hansen's Sports Challenge in their Wish List.